杜丹丰, 王迎辉, 郭秀荣. 低温等离子体协同木纤维柴油机尾气净化器性能试验[J]. 哈尔滨工程大学学报, 2019, 40(2), 419-425. DOI: 10.11990/jheu.201807085. DU Danfeng, WANG Yinghui, GUO Xiurong. 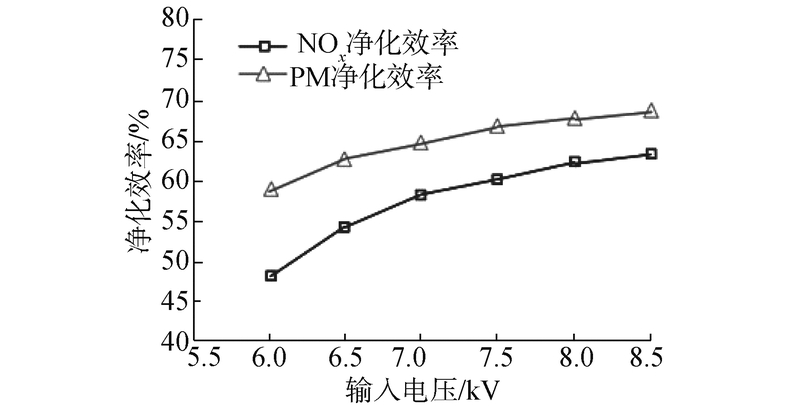 Experiment on the performance of the NTP synergistic wood fiber diesel exhaust purifier[J]. Journal of Harbin Engineering University, 2019, 40(2), 419-425. DOI: 10.11990/jheu.201807085. Abstract: To reduce the emissions of pollutants from diesel exhaust, the plasma wood fiber purifier was developed by combining plasma with wood-fiber-purified soot particulate matter (PM) and nitric oxide (NOx). Nonthermal plasma was produced by high-voltage pulse corona discharge. 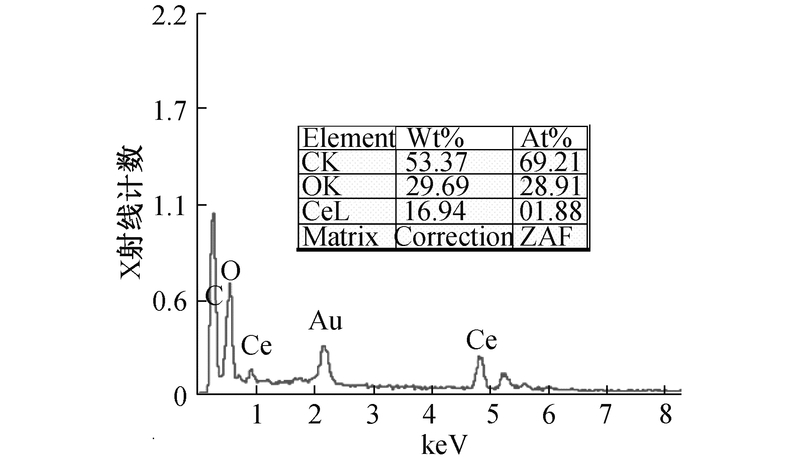 On one hand, the wood fiber core was used as the nanoscale cerium oxide (CeO2) catalyst carrier. On the other hand, the wood fiber captured PM effectively. A test bench was designed to measure the factors that influence the performance of PM and NOx. The simulated exhaust gas was composed of a certain proportion of N2, NO, and O2. PM was loaded on the wood fiber filter in advance. Furthermore, the gas temperature was controlled in the range of 100℃ to 230℃. 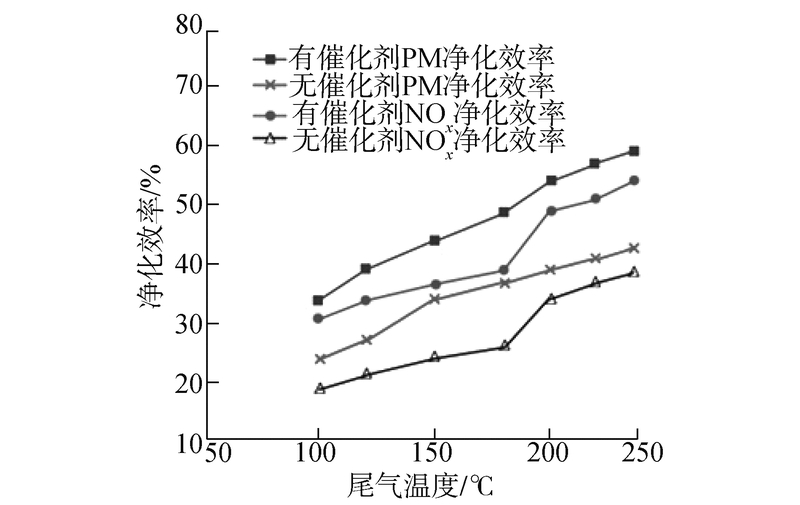 The results of experimental study indicate that the wood fiber can provide a qualified catalytic environment for nanoscale CeO2 and the purification efficiency of the purifier for NOx and PM can be enhanced by catalyst; the PM mass loaded on the filter core influences the purification efficiency for NOx and the purification efficiency increases with the increase in PM mass; and the input voltage of the purifier improves its purification efficiency for NOx and PM. 陈明功, 颜凌燕, 汪晓艳, 等. 介质阻挡放电协同铜氧化物催化剂脱除NOx反应研究[J]. 科技导报, 2008, 26(23): 52-55. 裴梅香, 林赫, 上官文峰, 等. 离子体辅助La0.9K0.1CoO3同时催化去除NOx和柴油机碳烟微粒的试验研究[J]. 燃烧科学与技术, 2005, 11(3): 278-281. 赵如金, 储金宇, 王瑞静, 等. 低温等离子体催化处理汽车尾气[J]. 高电压技术, 2007, 33(2): 174-177. 李晨, 舒新前, 王苏健, 等. 基于低温等离子体协同催化脱除氮氧化物和碳烟颗粒的研究[J]. 广东化工, 2015, 42(20): 1-2. 郭秀荣, 刘跃雄, 杜丹丰. 微米木纤维滤芯柴油机PM过滤装置冷却系统研究[J]. 森林工程, 2016, 32(2): 53-57. 杨华龙, 齐英杰, 郭秀荣, 等. 柴油车尾气堇青石DPF检测的研究[J]. 森林工程, 2015, 31(4): 68-72. 郭秀荣, 杜丹丰, 马岩. 炭化微米木纤维滤芯柴油机排放纳米颗粒吸附特性[J]. 江苏大学学报(自然科学版), 2013, 34(1): 7-12. 郭秀荣, 杜丹丰, 亓占丰, 等. 齿形木纤维柴油车尾气微粒捕集器过滤效率模型与试验[J]. 农业工程学报, 2016, 32(7): 66-71. 郭秀荣, 刘跃雄, 杜丹丰.长木纤维滤芯柴油车PM过滤装置冷却器: 中国, 203822417U[P]. 2014-09-10. 李翔, 杨冬霞, 常仕英, 等. 轻型柴油机尾气排放后处理技术进展[J]. 贵金属, 2015, 36(2): 70-76. 刘冀, 冯发达, 刘振, 等. 低温等离子体辅助去除含碳固态混合物[J]. 化工进展, 2014, 33(12): 3387-3392, 3398. 刘立东, 史永万, 高俊华, 等. 低温等离子体对柴油机尾气净化效果的研究[J]. 汽车工程, 2013, 35(2): 116-120.